BEWARE OF KILLER COOKIES! Years ago, I shared an apartment with two other singles: one male, one female. I decided to make stained glass cookie ornaments for the house. Enjoy! Christmas came and we decided to deck the halls. The roommates hung lights and put up a tree, while I got crafty. I wanted to try my hand at stained glass cookie ornaments, but took it one step too far and invented stained glass cookie votives. I am nothing if not the Martha Stewart of crafty flops, but these didn't flop! They were a huge success- at least that's what I thought. I made homemade gingerbread cookie panels (the walls of the traditional house). Then, I took cookie cutters and a cut a window in each panel. I filled the centers with leftover, Grandma candies from Halloween. You know, butterscotch rounds, red cinnamon circles, and lime things. I baked them in the oven until the cookies were done and the candies were squishy, pulled them out, let them cool, then built them into house squares minus the roof. Creative genius. I put a small votive in the center of each one and placed my work of art as a centerpiece on the table. With the lights off and a fire in the hearth, Christmas had arrived. The flicker pattern from the stained glass was glorious. Finally, I had a crafting home run. It was Christmas Eve. I was tired. With visions of sugarplums and gingerbread men in my head, I blew out the candle and trumped off to bed. The roommates were equally wooed by the masterpiece. So much, that one felt inclined to move it to the living room end-table to enjoy its splendor. A few hours later, it smelled as if Santa had come down the chimney and started baking cookies for us. I drifted back to sleep and awoke to the aroma of burnt cookies. A cloud of smoke filled the stairwell. My roommate rushed downstairs to find the couch smoldering, the end-table burnt to a crisp, and a trail of burning carpet. The male roommate had neglected to blow out the candle before going to bed. We lugged the table and couch outside, pointed fingers, and thanked God that we were alive. Thank goodness for apartment insurance, the smoke ruined the drapes, carpet, and furniture.You never know when it is your time to go. Who would think that you could die from a cookie incident. That was a Christmas I will never forget. I wish I had photos of the masterpiece, but these are similar. 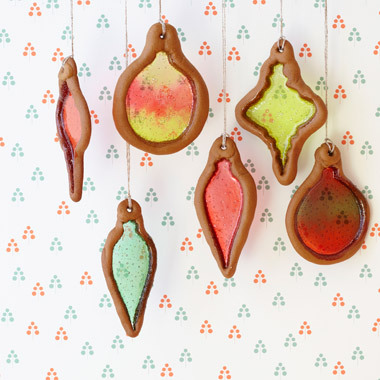 Here's a recipe for Cookie Ornaments, they won't burn down your house! Have a Happy and Safe Holiday Baking Season. THose cookies look amazing! I am your newest follower! Please stop by sometime and say hi!